We packed Thor and headed to Tucson, AZ from San Diego. We left about an hour late and therefore the temperatures in the desert were over 100 degrees when we crossed. Sadly, the air conditioning in our cab failed so we traveled with the windows open. It was hot, but with the addition of multiple liters of water and electrolyte pills, we made it safe. 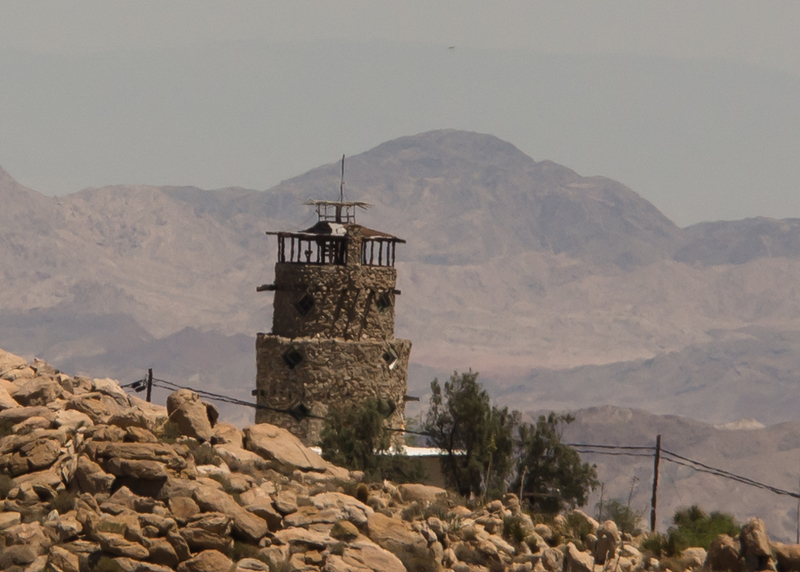 At the top of the In-Ko-Pah grade there is an old structure called "Desert Tower". This is a for-pay view point that was built in the 1930s. 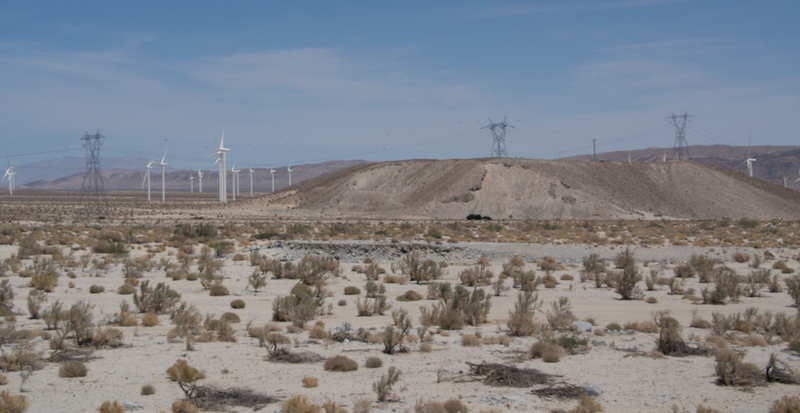 At the base of the grade there were new windmills since our last passage through this area. 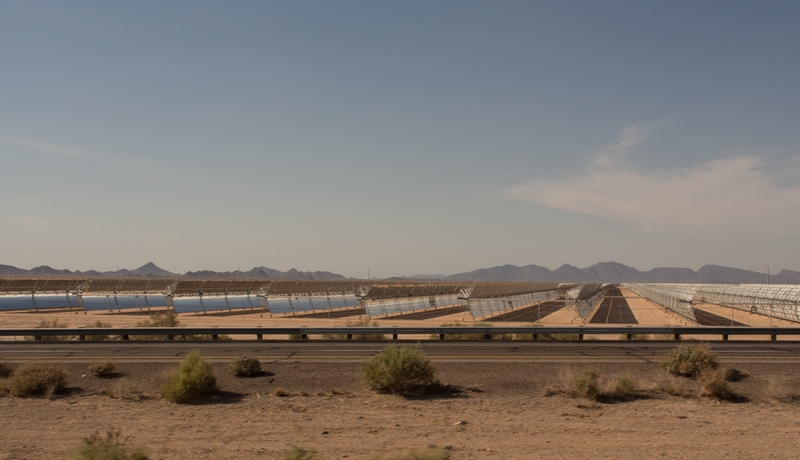 Outside of Gila Bend, AZ we drove past a very large solar thermal generating station. The facility was many hundreds of acres along side of I-8. 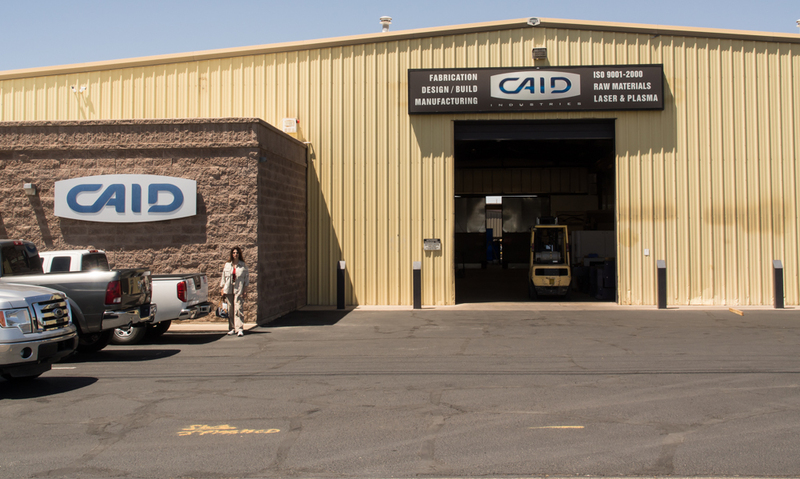 While we were in Tucson, we visited the (ex) family business, Caid Industries. The business is being run by Bill Assenmacher and he is doing a first rate job. 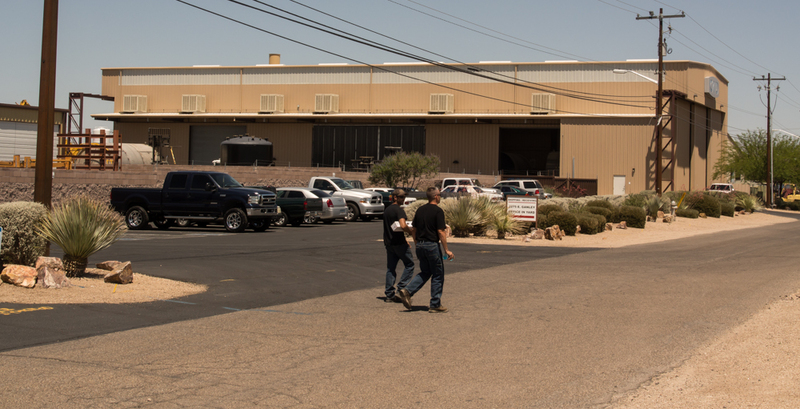 The business is growing well and they have built several new buildings including this large shop. 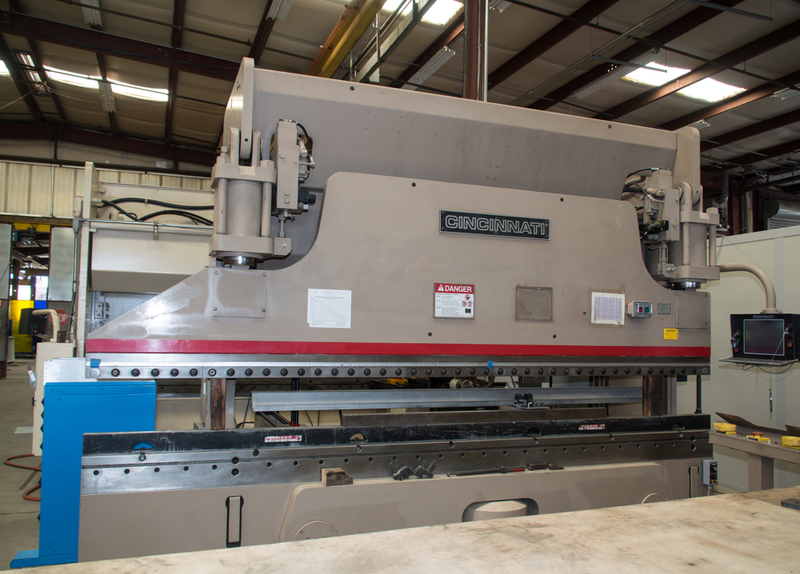 They have amassed some impressive capital equipment and tools including this hydraulic press brake for bending metal. 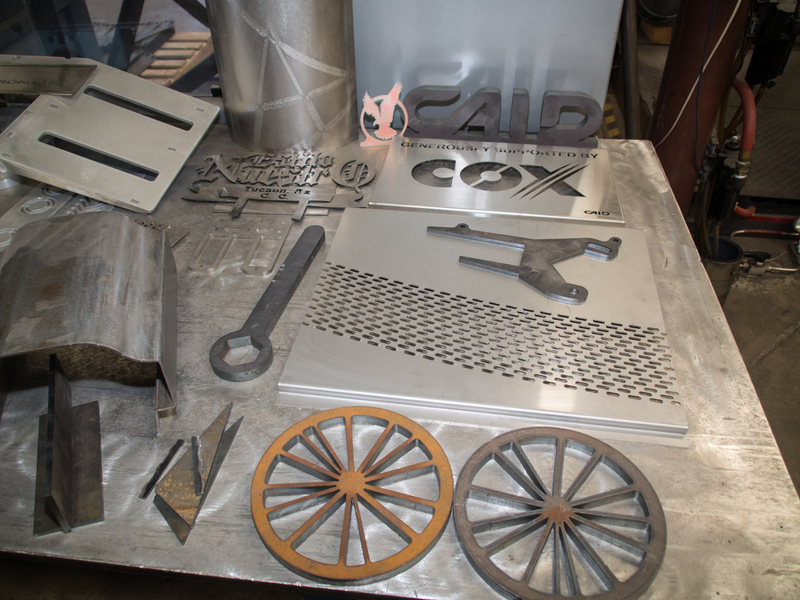 This is an example of some of the detailed work that can be performed with the laser cutter, water jet and machine shop tools. This is a fixture used in the assembly of solar reflector panels. I took a photo of myself in the reflective surface of one of the solar panels. 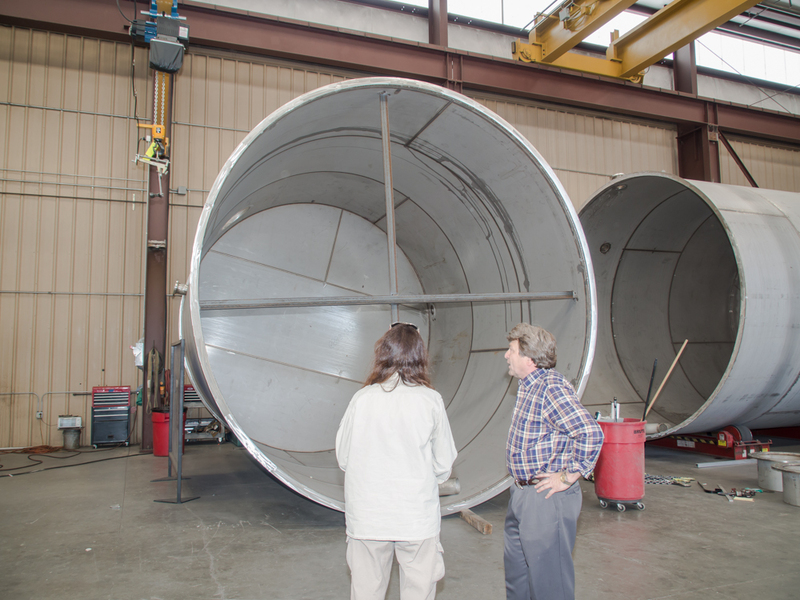 These are bent to the correct curvature and reflect the sun to a heat collection plumbing system that connects with the power plant. 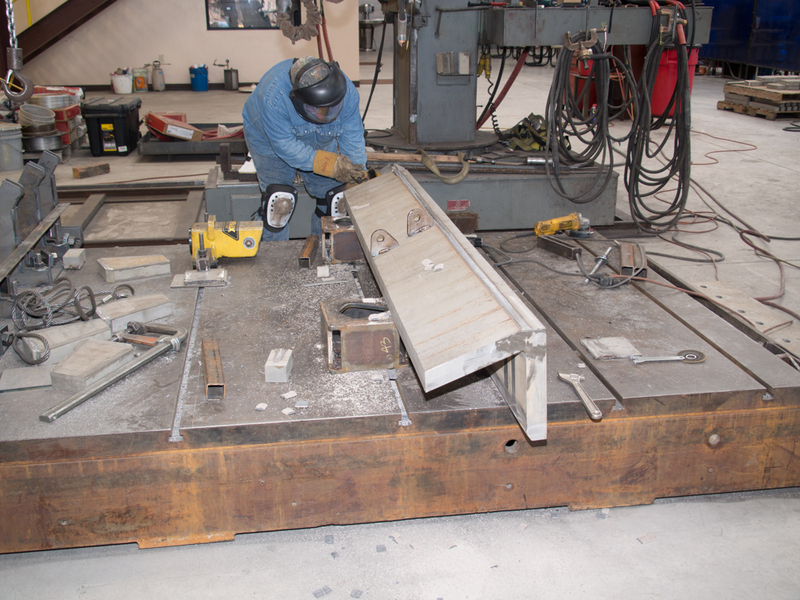 This fixture is also used as part of the solar collector assembly process. 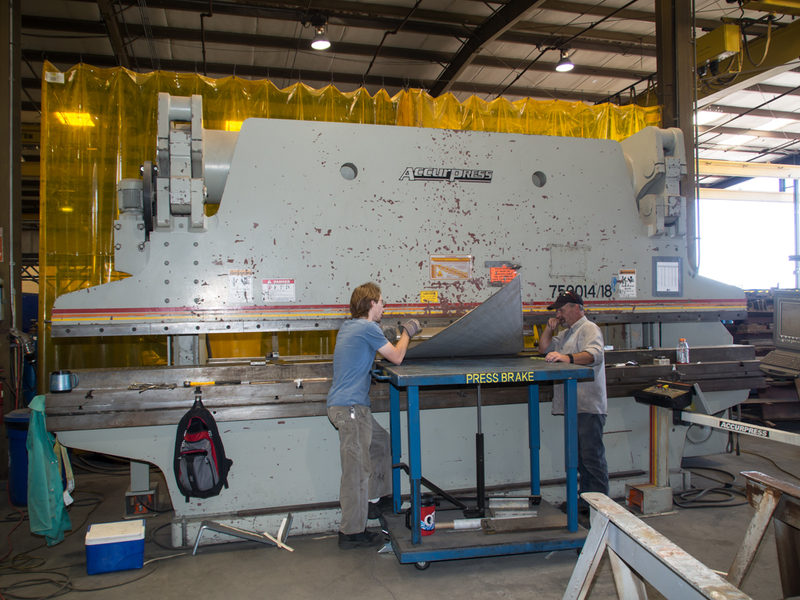 A team of workers are running a press brake bending large sheets of stainless steel. 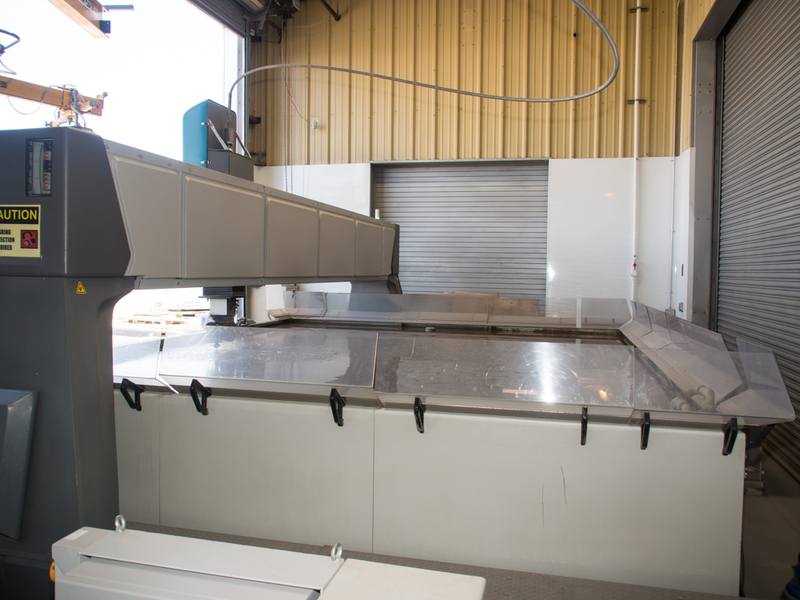 This device is the water jet cutting machine. This machine uses garnet grains transported by very high pressure water to eat holes in material. 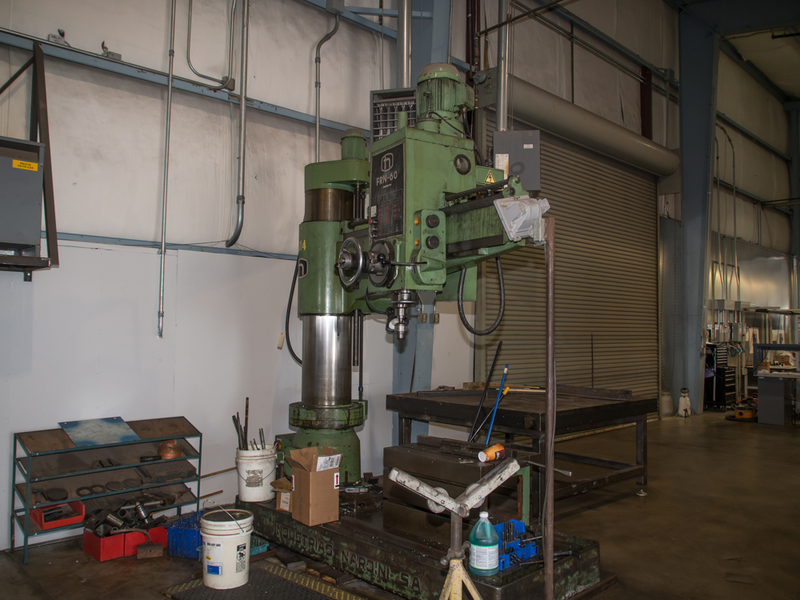 The machine can cut steel several inches thick. 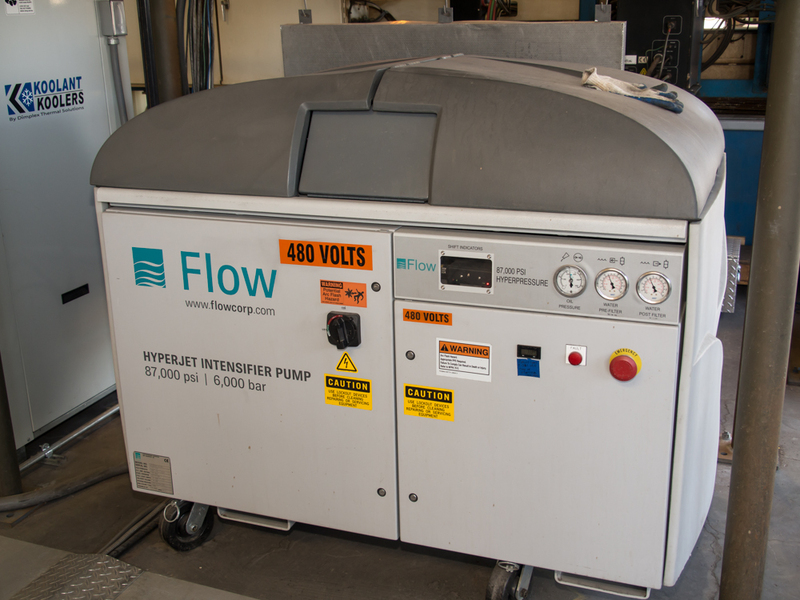 This is the water jet control unit. Note that the operating pressure is 87,000 psi. 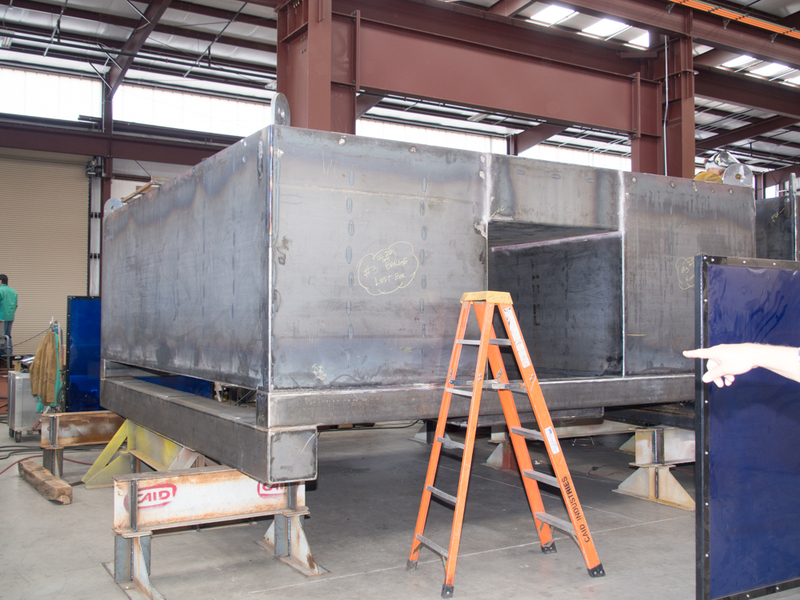 Some large plumbing being fabricated for a job in South America. 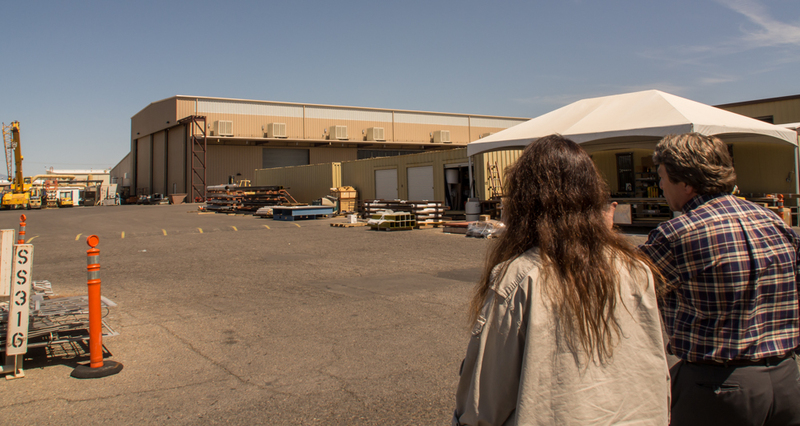 Bill is leading Kathleen to one of the newer buildings of the facility. 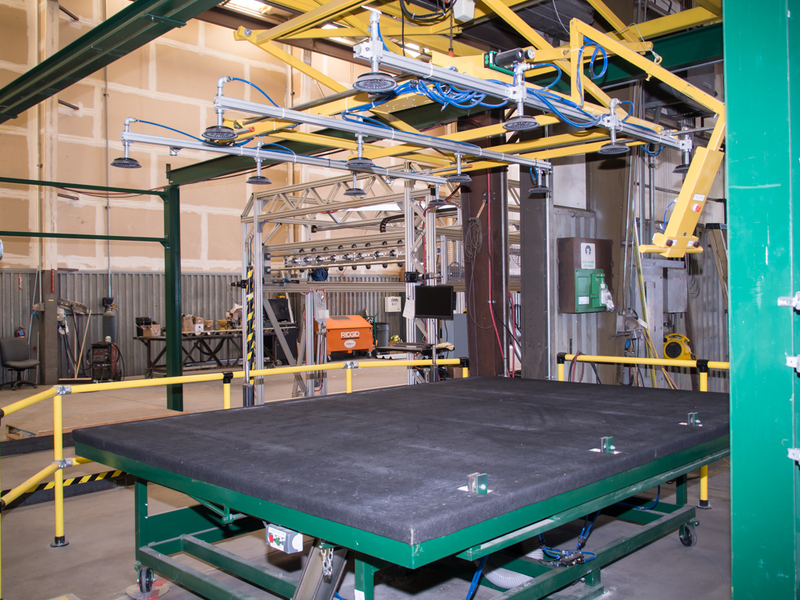 The device with the red bar is a track welding robot and can weld material with great precision. 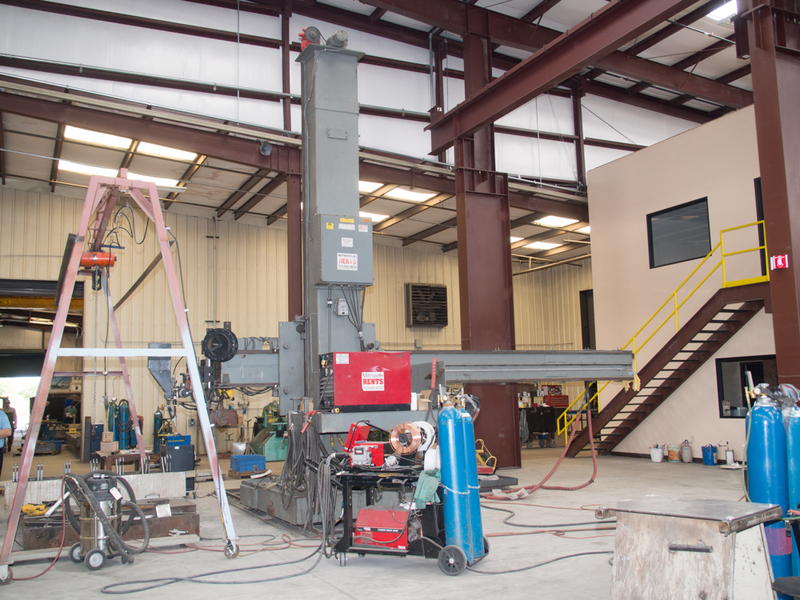 Another track welding machine used as part of fabricating large tanks. 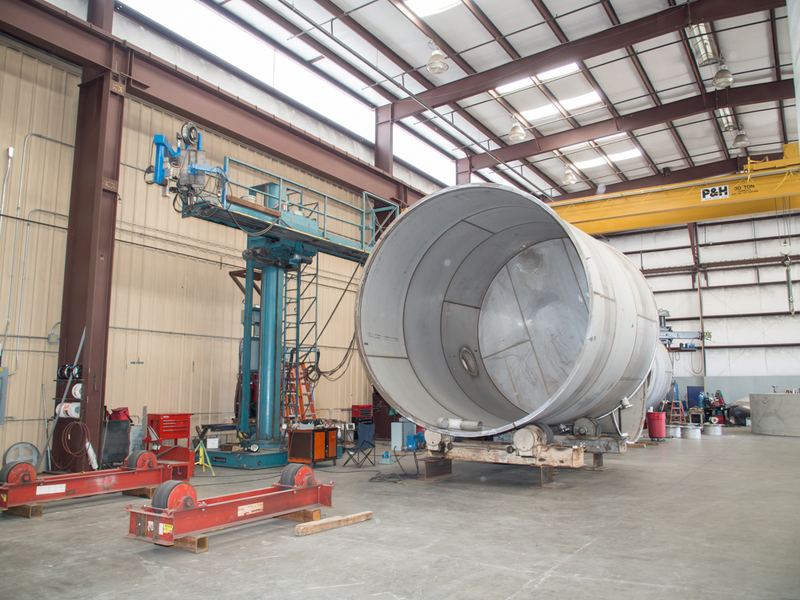 These are large stainless steel tanks. 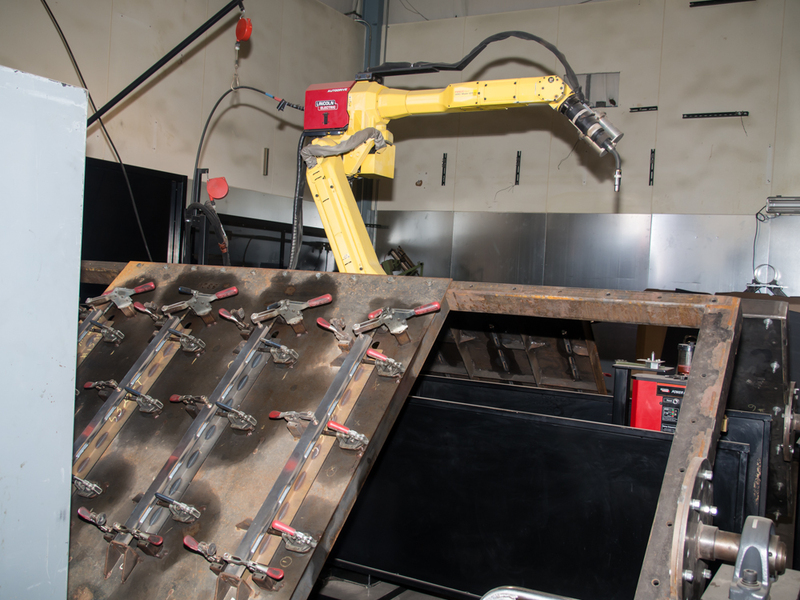 This is another type of welding robot from Fanuc and can weld complex geometries. 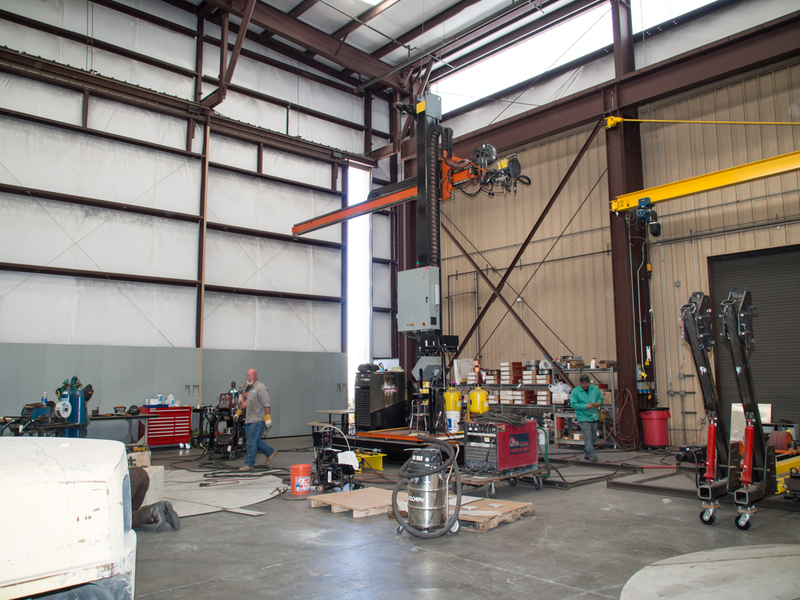 The large collection of welders, cutters and machine tools uses plenty of power. 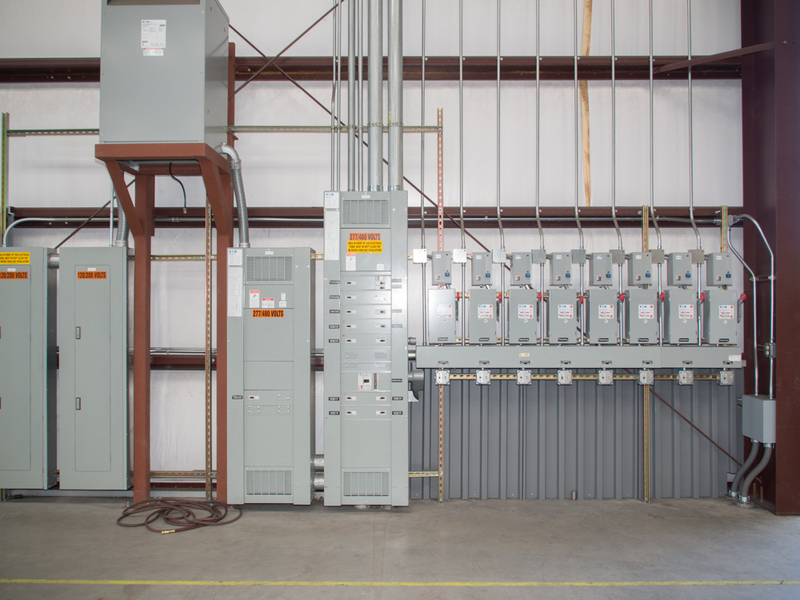 This is one of the distribution panels. 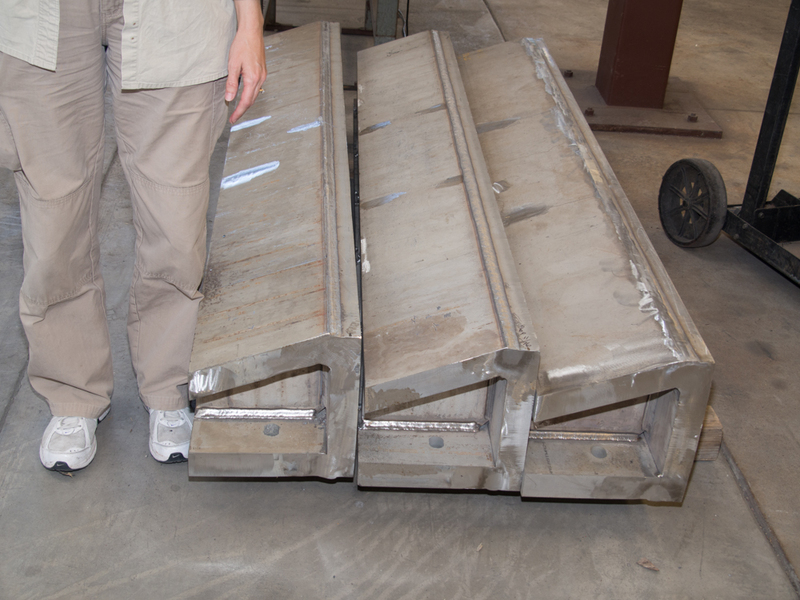 This odd structure is part of a packing crate for a very large telescope mirror. 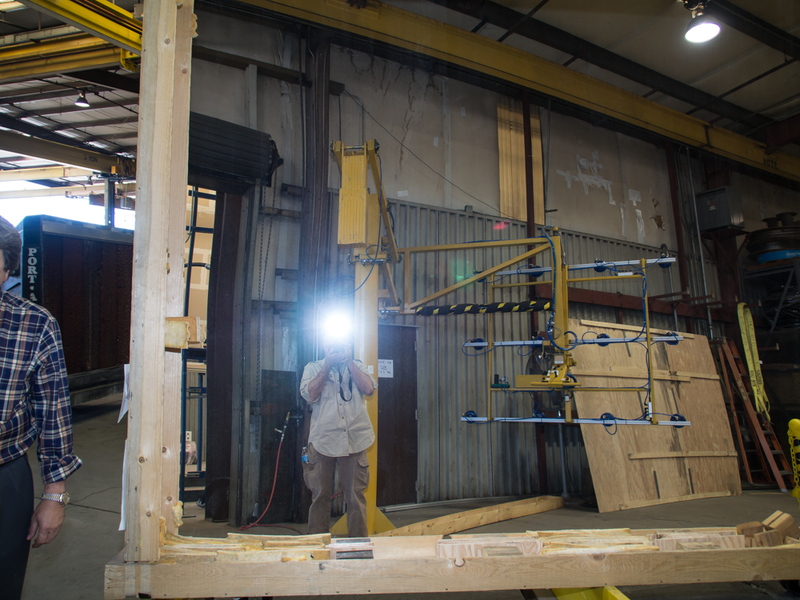 The mirror is attached to the frame and then encased in a bullet-proof case for transport from the fabrication facility to the observatory. 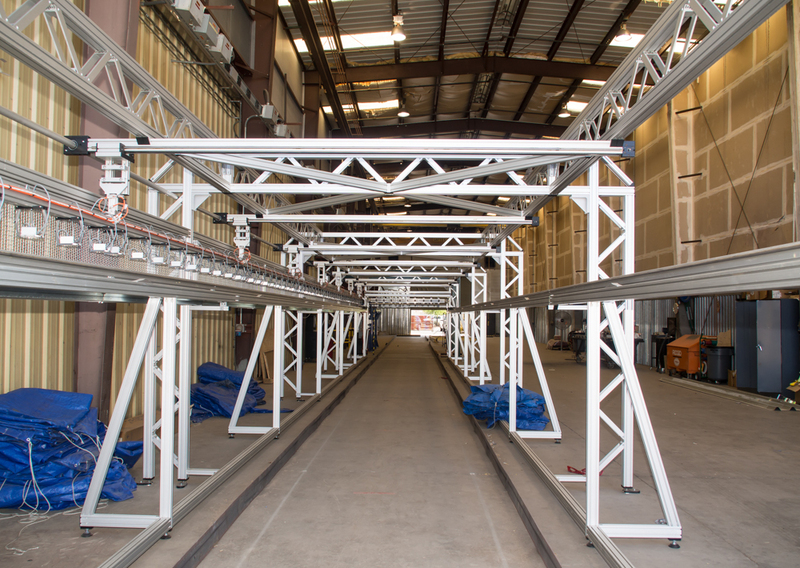 More of the mirror transport frame. 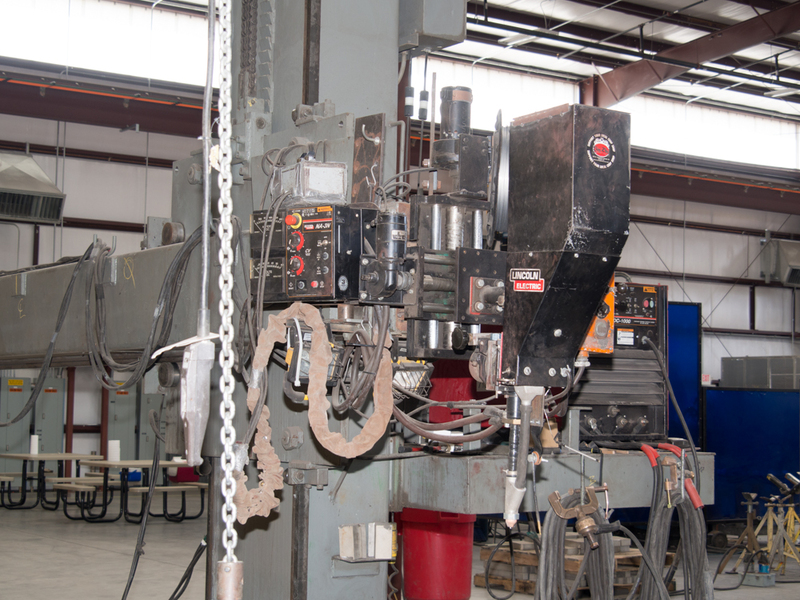 These robot welders can produce precision beads many feet long. 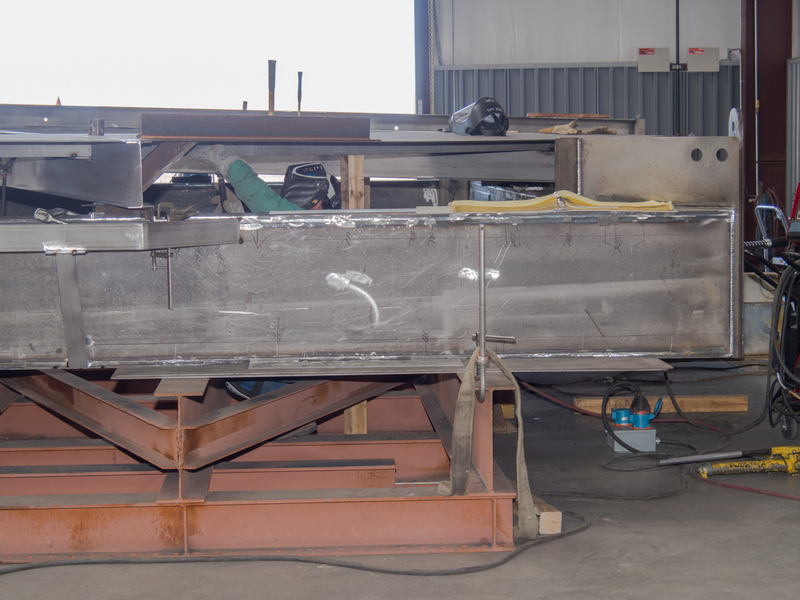 These super-thick stainless steel plates were welded together using a many-pass process to weld the entire thickness of the material. 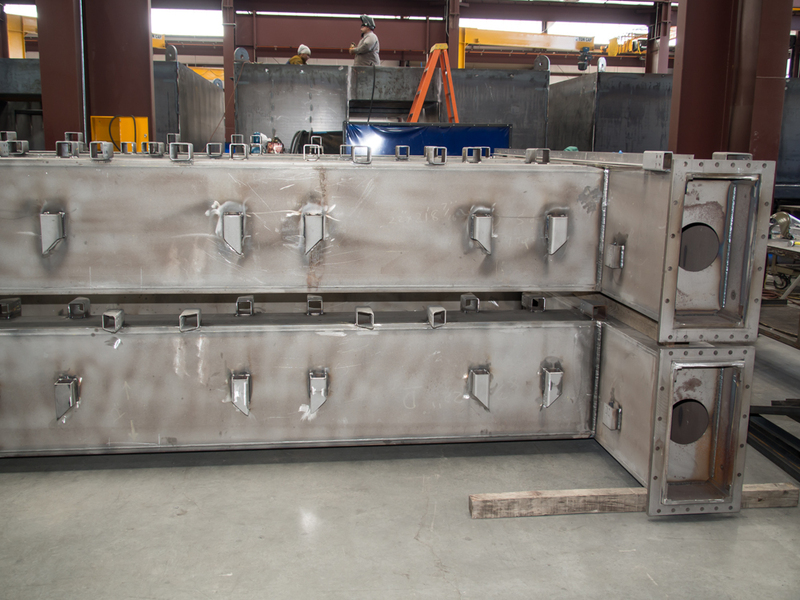 Above, more thick plates are assembled using the multi-pass welding process. 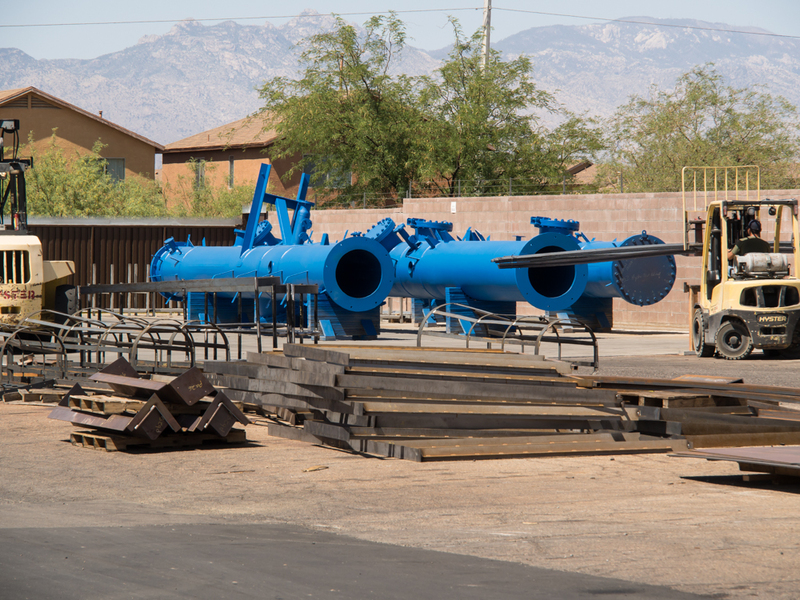 These are pump barges used at copper mines. A large pump is installed on the top of the barge to skim concentrated copper off the flotation ponds. The square pontoons at the bottom are filled with concrete for ballast. 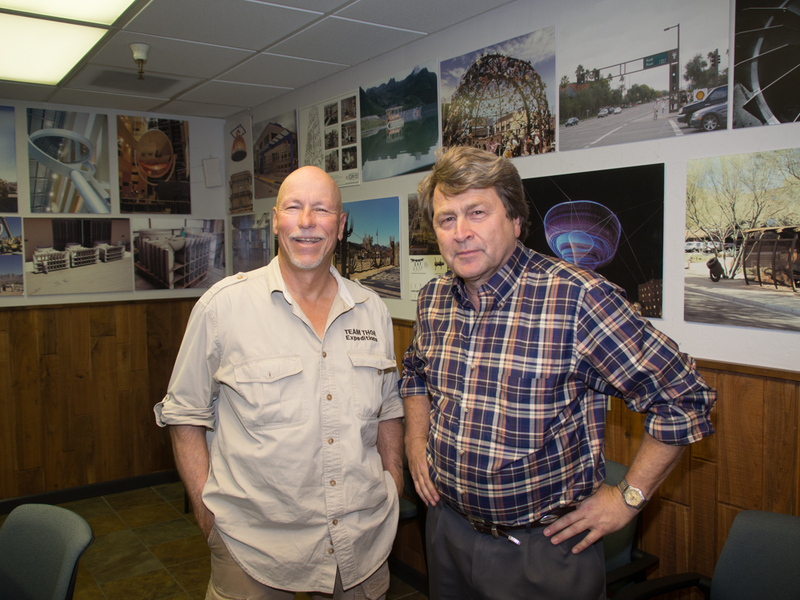 Bill and Bill with some of Caid's past projects on the wall. 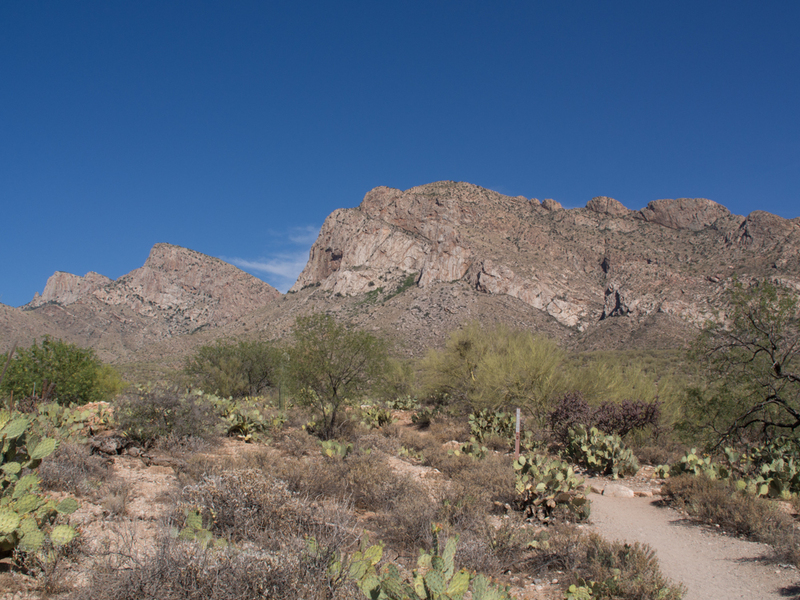 One our way back to the parent's home, we got a nice view of Pusch Ridge on the west end of the Santa Catalina Mountains. The desert plants were reasonably happy due to recent rains. The travel across the high desert was hot. Putting air conditioning in the truck was completed last year, but we had a failure. We'll get in resolved "soon" but meanwhile we will be doing plenty of sweating. Next, we head to Oracle, Phoenix and then to Flagstaff, AZ for Overland Expo.